Do you have a dial up connection or a dynamic IP Address? Do you like to know what your IP address is from anywhere in the world, even if your connection drops out and reconnects?? If so, then iPost is for you. Simply create a template page for iPost to use, specifying what type of details you want it to add. 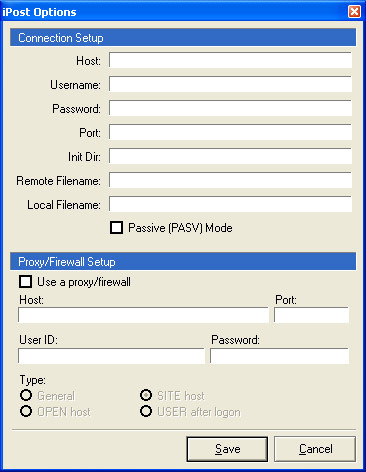 Details can be anything like IP Address or current time of posting, etc. 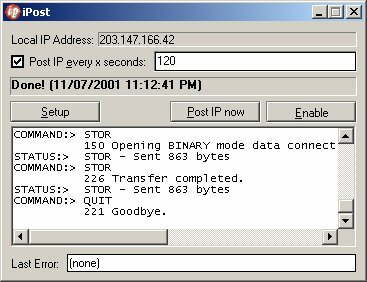 iPost will monitor your IP address and upload a modified copy of the template filling in the details that you want it to report to a web site somewhere. From there you can view the site and see your IP address! 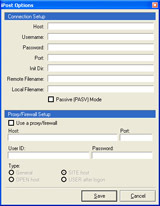 iPost is no longer under active development and has been Archived.